“Spielzeug.” Héctor MORO: Lichtzwang, ein wütendes Spielzeug (2002)1. Gérard GRISEY: Solo pour deux (1981)2. Philemon MUKARNO: Farah (2008)3. Toshio HOSOKAWA: In die Tiefe der Zeit (1994, rev. 1996; ver. 2001)4. Christian WOLFF: Exercise No. 3 (1973-75)5. 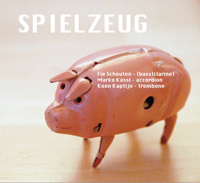 Fie Schouten1,2,3,4,5 (clar, b-clar), Marko Kassl1,3,4,5 (accordion), Koen Kaptijn1,2,3,5 (trb). Karnatic Lab Records KLR 019 (1 CD) (http://www.karnaticlabrecords.com/). I’ve been enjoying this disc for quite some time, a magical release featuring an unlikely trio of clarinet (doubling bass clarinet), accordion and trombone. Breath and shape are crucial to these pieces’ projection and the results entrance. There are times when duo or trio fuses together so successfully it’s hard to tell whether the high note is a trombone, the low note a clarinet, or the reedy sound an accordion. Moro’s Lichtzwang is a bustling calling card, amply indicating the trio’s capabilities. Grisey’s Solo makes serious play of the clarinet/trombone pair. Mukarno’s Farah, written especially for the ensemble, introduces mechanical noise and explores combinations of attacks over sustained notes. Here we have Hosokawa’s In die Tiefe der Zeit with a clarinet taking the part originally meant for viola or cello. The work is indescribably smooth, the tapering lines wonderfully executed. The Wolff Exercise stands as an encore, the trio in semi-unison wandering over a single, relaxed line as if one. 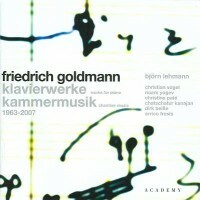 Friedrich GOLDMANN: Linie/Splitter 2 (2006, rev. 2007)1; Sonate (1987)2; Trio (2004)3; Vier Klavierstücke (1973)4; Calmo, esitando un po’ (2004)5; Zwei Intermezzi (1963)6. Björn Lehmann1,2,3,4,6 (pno), Christian Vogel1,5 (clar), Noam Yogev1,3 (hrn), Christine Paté1,5 (accordion), Chatschatur Kanajan1,3 (vln), Dirk Beiße1,5 (vlc), Errico Fresis (cond.). Academy 0085242ACA (1 CD) (http://www.edel.com/). Goldmann doesn’t slot easily into the century’s big trends. Linie/Splitter 2 opens humorously to the accordion, clarinet and piano’s tango hints. Yet tragedy strikes as the clarinet plunges into a lonely detour after which the ensemble becomes pitchless (breath noises, clicking) and inert (the accordion’s long tones like distant electronic alarms). The program’s remainder turns back the clock, but now we’re on guard. The piano Sonata and the first Intermezzo offer quickly evaporating lightness. The two trios (horn/violin/piano and clarinet/accordion/cello) expose precise details. “nearly – fast.” Harald MUENZ: nearly – fast (2008)1; data compression (2009)2; fein … auflösend (2010-11)3; >>schönes klavierstück<< (2006)4; dietro V avanti (2006-07)5. ensemble mosaik: Bettina Junge3,5 (fl), Christian Vogel1,3,5 (clar, b-clar), Chatschatur Kanajan2,5 (vln), Mathis Mayr3,5 (vlc), Ernst Surberg1,3,4,5 (pno), Roland Neffe1,5 (perc), Franka Herwig2 (accordion). Coviello COV 61117 (1 CD) (http://www.covielloclassics.de/). Nearly – fast unfolds pleasurably with clarinet, marimba and piano scatterings. Muenz makes much of his working methods, the notes suggesting that his music often comes about as the unanticipated artifacts of constructions. The results do interest, though some pieces, like the six-piece dietro V avanti, reflect Boulezian colors that don’t appear elsewhere. A transformed orchestral piece, data compression knits remnants for violin and accordion. Muenz has created music from masticated artifacts. fein … auflösend subjects tonal material, in this case Christmas carols, to cryptic procedures. The ironic piano bagatelle >>schönes klavierstück<< stakes a claim for beauty that it never uncovers. “Strange Paths.” Michael GORDON: XY (1998). Iannis XENAKIS: Psappha (1975). Brian FERNEYHOUGH: Bone Alphabet (1992). Stuart Saunders SMITH: They Looked Like Strangers (2009). 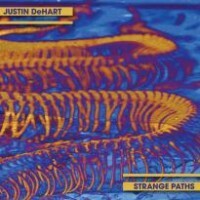 Justin DeHart (perc.). Innova 849 (1 CD) (http://www.innova.mu/). I’ll go out of my way if Bone Alphabet and Psappha are on the same program. DeHart’s Ferneyhough is taut, but his Xenakis is muted. Psappha ought to gyrate and explode, so maybe it’s the instrument choices. Gordon’s XY requires asynchronous hands: One slows as the other speeds; when one gets louder the other diminishes. Every composer attempts this gimmick (I worked it into a piano piece). Gordon maintains interest across a quarter hour via subtle shifts. Smith’s four-movement vibraphone solo departs from a childhood memory with what sound like variations. Solo vibe pieces generally tend toward the unbuttoned casual; these pieces play as constricted and restrained. 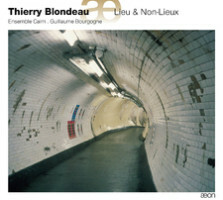 Thierry BLONDEAU: Non-Lieu I (1998)1; Non-Lieu II (2002)2; Lieu I (2007)3. Christelle Séry1 (guit), Ayumi Mori2 (clar), Jérémie Maillard2 (vlc), Ensemble Cairn3, Guillaume Bourgogne3 (cond.). Aeon AECD 0984 (http://www.aeon.fr/). Here we delight in large works for small forces. Non-Lieu I ends with its solo guitar playing while departing the stage. Non-Lieu II for clarinet and cello asks each player to assist the other, alternately creating three-handed clarinet and cello. Lieu I’s nine parts are actually three intersecting trio sequences. The guitarist enters Lieu I the same way he left in Non-Lieu I as do the clarinet and cello pair. Harder to discern is the sequence whose three sections appear out of order among the other movements. There is much to treasure here. 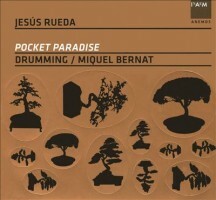 Jesús RUEDA: Pocket Paradise (2006-08); Marimba Estudio (2007)*; Estudios expresivos (2003); Luna Nueva (2000)*; Perpetuum Mobile (1998). Drumming, Michael Bernat* (perc., cond.). Anemos C33004 (1 CD) (http://www.diverdi.com/anemos). A prior Rueda release on col legno had interested, but then Naxos (8.572417) revealed the composer drifting towards blandness in a 2004-07 Third symphony. Despite a dedication to bold modernist Francisco Guerrero, the accompanying 1998 Viaje imaginario presented a smooth face quite different from the music of its dedicatee. Given the noise of an attack, percussion clothes consonance amid angularity. We hear tangy vibe chords and struck membranes and metal. Consequently this release recalls the col legno portrait even though several pieces are contemporary with the Third. There’s a steel drum quartet (Estudios expresivos), a marimba etude (Marimba Estudio) that requires the bars to be bowed, and solo piece set in a sonic junkyard (Luna Nueva). Pocket Paradise is a symphonic sextet for percussion that asks the players to use their bodies. I understand a bit better now where Rueda is going. Georg Friedrich HAAS: Quartet (2007). Beat FURRER: fragmentos de un libro futuro (2007). Manuel HIDALGO: (Kampftanz) (2000). Helmut OEHRING: Mich.Stille. (2000). Markus HECHTLE: Linie mit Schraffur (2006). Aleph Gitarrenquartett: Andrés Hernández Alba, José Javier Navarro Lucas, Wolfgang Sehringer, Tillmann Reinbeck (guitars), Petra Hoffmann (sop), Ernesto Molinari (clar). 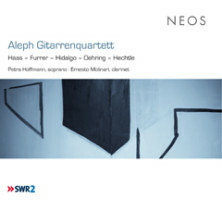 NEOS 11208 (1 CD) (http://www.neos-music.com/). Aleph’s clear and precise execution defines and redefines the notion of four guitars working together. Two pieces ask for a guest: Furrer’s work for quartet and soprano dissects Classical patterns, whereas Hechtle unifies the guitars to create a strumming cluster over which the clarinet hurdles. Hidalgo’s offering, the most conventional, fractures fandango gestures. Haas requires unique tunings for a peppery swirling dust cloud. Oehring supports the quartet with a tape of a sighing woman. A narrative is suggested even as the players cover their hands in plastic bags to create an effective brushing effect. Michael GORDON: Timber (2009). Slagwerk Den Haag. Cantaloupe CA21072 (1 CD) (http://www.cantaloupemusic.com/). Let’s head to the lumber yard for inspiration. Actually, Gordon takes Xenakis’ simantras, essentially resonant 2x4s, out for a transfixing hour-long spin. There are only six pitches in this work for mallets and lengths of wood. The piece is about changing patterns and how the notes evolve to encircle the listener. The resonance after the beams are struck is particularly bewitching as a whole second category of buzzy chords and patterns appear. 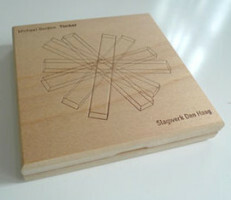 Cantaloupe has released the disc and booklet in a wooden clamshell box which I predict will become a collectors’ item. 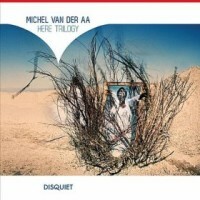 “Here Trilogy.” Michel VAN DER AA: Here [enclosed] (2003)1; Here [in circles] (2002)2; Here [to be found] (2001)3. Claron McFadden2,3 (sop), Netherlands Radio Chamber Orchestra, Peter Eötvös1, Etienne Siebens2,3 (conds.). Disquiet Media DQM 02 (1 CD) (http://www.disquietmedia.net/). An engaging triptych, this, on identity, location and perception. The language and techniques (with roles for technology and dramaturgy) connect the composer to Andriessen and Bernhard Lang. Repetitions are achieved via musicians or tape and/or electronics. Here [in circles] asks the soprano to manipulate a cassette deck during the piece, recording the proceedings to achieve a distinctive rewinding warble and the music folding upon itself. Similar effects with greater force occur in Here [enclosed] which simplifies as the orchestra enlarges. The recording can’t show an onstage box, perhaps a magician’s prop. This “cabin” must mean something simply because it’s there. Only toward the end it reveals a woman inside (unclear whether actor, video or still image). A solo violin takes precedence after the reveal. Van der Aa, who wrote his own texts, provides the soprano a very high line. Elsewhere a percussionist manipulates mechanical switches to produce distinctive clicking sounds.